This is a guest post from Tara Wagner, cofounder and creator of Sustainable Baby Steps: Small Steps Toward Greener Living. Probably the most common complaint I hear when it comes to eating healthier, supporting sustainable agriculture, and avoiding genetically modified or corporate owned foods is the cost of organic food, particularly the cost of meat. It can easily run 2-3 times more than factory-farmed, corn-fed, and chemical-loaded beef or chicken, making it impossible for most households to swing. This is compounded even further depending on where you live. If there are no local sources of good meat, and no stores that offer “better” meat for a better price, you might be looking at ordering grass-fed beef or pastured chicken online. The shipping alone is going to kill your budget. Not every meal needs meat, especially if the meat you are eating is from a great source. Pastured animals have higher levels of things like CLA, omega-3 fatty acids, Vitamin A and more. Meaning you can easily get the nutrition you need, even eating far less meat. Try keeping your breakfast and lunch vegetarian and even including a few veggie dinners in your week, so that more of our budget can be going to quality of meat you want. Buying chicken that is “boneless and skinless” means paying more for the work the butcher did for you. Buying a whole chicken is not only cheaper, it’s very easy to turn 1 bird into three meals. Our family of three (with a teen who eats like he’s 3 people) routinely does this by roasting or slow cooking the whole chicken, serving half the meat with one meal (heavy on the veggies), the rest of the meat with a huge salad or stir-fry the next meal, and then making a soup from the carcass (described below). The same can be said for larger cuts of beef or pork that can be cut and ground by you into portions for several meals. Learn how to process meat with the right seasonings and preparations and you’ll save about 75% on the cost of things like sausages, hamburgers patties, etc. Chicken bones are probably the easiest to make a “bone broth” with, but the same can be done with any bones. Just fill your crockpot with the bones, and enough water to reach the top and let it stew on low for 1-3 days for chicken or fish, and up to 7-10 days for beef or pork. This allows the marrow (the healthiest part of the bones) to soften and release nutrients into the broth, giving you one of the healthiest stocks you can possibly eat. Strain this and use it for any type of soup or veggie stew, such as minestrone, ratatouille, or some other inexpensive hodge-podge of leftover veggies and sauces. Or maybe just a half. Find a friend or three and go in on a “cow-sharing” option. This routinely knocks the price down for $6-8 a pound to $2.50-4 a pound instead (the same as the grocery store but with twice the nutrition). Of course it means having a freezer, but you can generally buy a small box freezer that can fit in a closet or other small space for less than $100 (be sure to get the kind that opens on top – it wastes FAR less energy by not spilling the cold air when it’s opened, making its operating costs very minimal). What could you raise yourself? This isn’t for the faint of heart (and it may not even be legal in your area), but it is an option for anyone willing to do some backyard butchering. Rabbits are usually seen as the best option here (being small, easy to raise indoors, prolific at procreating and giving you some perfect compost in the meantime). And you might not even have to raise the animal yourself: Many owners of egg-laying chickens will happily send their non-laying hens on to another owner who is less squeamish about turning them into “stew hens”. There are, of course, dozens of more ways to make organic food affordable. What about you? 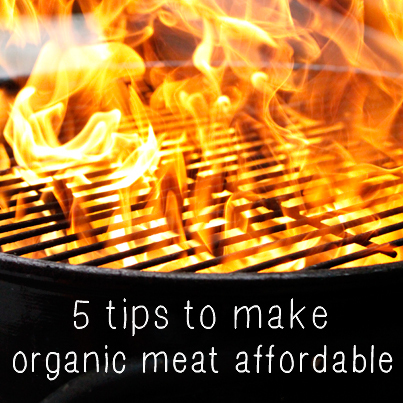 What do you do to minimize the cost of organic meat? Tara Wagner helps others live organic lives by offering affordable, creative, and realistic ideas to help you go green and create a life worth sustaining. You can find more ideas on this and other topics on SustainableBabySteps.com, including a free ebook on Sustainable Strategies to Save Money. Wow, great post Heather These tips are a huge help, both for my tummy and for my money. I noticed that the healthy foods that I love to eat can cost a lot. Definitely doing the gardening and make my salad fresh from the yard.